Let’s start with the head, where we have the snout, the cheeks and the ears, which can be cooked in different kinds of stews (in Galicia they are big fans of the “cachucha”, or head), in fried tapas or in a sauce. The brains and tongue are very important in popular cuisine. 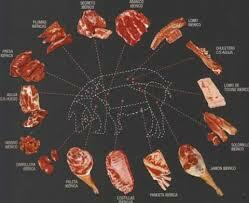 The more gelatinous parts are used for preparing cold cuts, such as the sausage made from wild boar or pork head. The dewlap is used in stews and roasts, and the lean parts of the neck are very tender and used for mincing and also for grilling. Next is the body, where we find the loin, a very tasty part with a low fat content. This meat can be cooked whole in the oven, in steaks for grilling or prepared as a cold cut (cured pork loin is a delicacy, particularly if it comes from Iberian pork). Then we have the area that joins the rib cage to the loin, from where we extract the chops. They are perfect for grilling, marinated or in a sauce. At this point we come up against the rib cage, one of the most highly valued parts and ideal for the barbecue, fried, baked and in a sauce. Here we encounter the part that comes before we reach the ham, between the loin and the lumbar ribs, which is none other than the fillet, a lean and very juicy cut that can also be prepared in multiple ways. Then comes the animal’s tail, used in many stews, just like the flank. As for belly pork, this is a very fatty part from which bacon is obtained and is used, either fresh or cured, for making many dishes containing pulses (lentils, beans, stews and more). Another section deserves a special mention, the “secreto”, the secret, so-called because it is hidden between the shoulder blade, the ribs and the belly pork. It is a veritable culinary delight. Let’s now talk about the paletillas, the animal’s shoulders or front legs, smaller than the hams or back legs. Besides curing them, they can also be roasted. The front leg contains the knuckle, fat-covered and intense in flavour that also makes a delicious stew. And lastly we come to the trotters, which can be cooked in the oven or breaded.